It is the end of July. And sure, you knew this was going to be a rebuilding year. It wasn’t supposed to be a good team. But knowing how it’s going to go and watching it happen are two different things. We can all be forgiven for thinking there are better ways to spend the last two months of the season. But, you know, once the season ends, it’s going to be a while before there’s baseball again. So maybe we can come up with some reasons to keep paying attention. The Reds are already a young team and they’re about to get younger. A Jay Bruce trade is so certain that I may have to rewrite this paragraph before this column posts. Whenever it does happen, it seems almost equally certain that Jesse Winker will be making his major league debut along with his .385 AAA OBP. With that, we can start to see how often he’ll get on base at the major league level and what happens when Joey Votto actually has someone on base to drive in. Jose Peraza, one hopes, will eventually get playing time, though Reds management has been extremely frustrating on this front. Still, when he’s in the lineup, I pay attention just for that reason. And though we may be used to them, we still need to keep an eye on Eugenio Suarez, Billy Hamilton, and Tucker Barnhart. They are still kids, after all, and you never know when some some new light bulb might click on. The rotation is so young it could be lumped in with the last section, but Homer is still part of the conversation, so I’m splitting it out. He’s slated to start for the Bats today in what could be his final rehab appearance. If all goes well, the Reds will have a rotation that includes Homer, Disco, Cody Reed and Brandon Finnegan. All of those guys are likely part of the future. Add to it that we may get cameos from Robert Stephenson and maybe even Amir Garrett, and it could be fun to watch what happens. While we’re on the subject, keep watching Cody Reed. If you believe that his early struggles are indicative of his true talent, I have some tropical islands in Northern Canada I’d like to sell you. He is still young and still learning. He’s also striking out almost ten batters a game. Baseball history is filled with great pitchers who got off to rocky starts as Chad Dotson showed us. 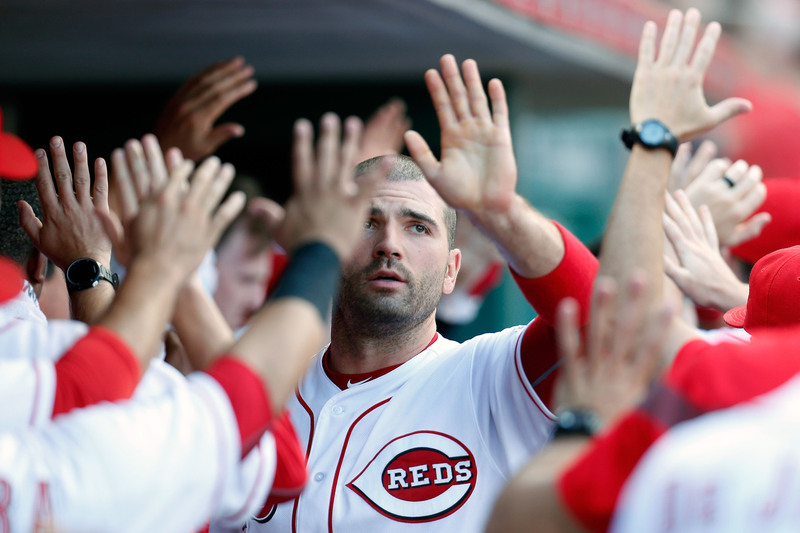 Joey Votto has been carrying an OPS close to 1.100 since the start of June and he’s only been getting better in July. He’s historically been a better hitter in the second half and if we’re likely to see something in the neighborhood of his unbelievable 2015 second half, it will not be surprising at all if he’s the best hitter in the league from now until the end of the year. It will be September soon enough. This year, I’ve had a press pass to Louisville Bats games and there are a bunch of fun players who could get rewarded with September call-ups. You’ve seen some of them in Cincy already, of course, but players like Jermaine Curtis, Hernan Iribarren, Tony Renda, Steve Selsky, and Scott Schebler have had really nice seasons for Louisville (or, in Renda’s case, Pensacola and Louisville) and could all end up being good organizational guys. Plus, it would be fun. And remember, this season notwithstanding, baseball is supposed to be fun. It is easy to look at the current record and think that this team is a disaster, but the Reds on the field right now are not the Reds who broke camp in April. Brandon Finnegan is the only pitcher currently in the rotation who was there when the season started (momentary pause as we weep about Raisel Iglesias not starting). This is a team that is supposed to be getting better, and no one says it has to start with the beginning of a season. We all think of the recent run of good teams as starting in 2010, but the Reds were 27-13 during their last 40 games in 2009. You never know when it will click. They currently have a winning record since the break and I wouldn’t be surprised at all if they played at least .500 baseball from here on out. If you want to, think of it as the kind of preview we always want from spring training only with players who are actually ready and actually playing against major league competition. One of the best things about baseball is that unexpected things happen all the time. And sometimes, bad teams turn into good teams right in front of your eyes.